May 31, 2011: It sounds like an oxymoron: a solar eclipse at midnight. According to NASA, it's about to happen. "It might sound like a contradiction to have a solar eclipse in the middle of the night, but this is what we will see in northern Norway, Sweden and Finland on June 1st," says Knut Joergen Roed Oedegaard, an astrophysicist at the Norwegian Centre for Science Education in Oslo. 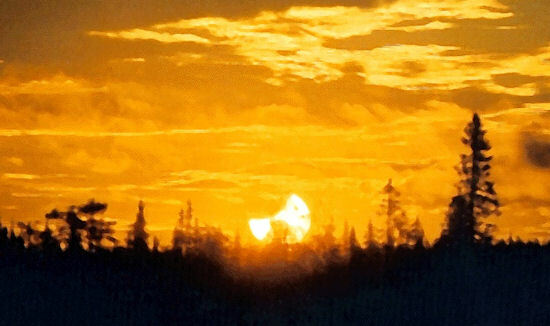 A previous "midnight Sun" eclipse photographed by Oddleiv Skilbrei in northern Sweden on July 31, 2000. The eclipse of June 1, 2011, will be more than twice as deep. At this time of year, he explains, the sun doesn't set in Arctic parts of the world, so a solar eclipse is theoretically possible at all hours of the day. When the clock strikes local midnight in northern Norway at the end of June 1st, about half of the lingering sun will be covered by the Moon. "The eclipse can also be seen from Siberia, northern China, remote parts of Alaska and Canada, and Iceland," writes Fred Espenak of the NASA Goddard Space Flight Center, where the eclipse circumstances were calculated. "Greatest eclipse occurs at 21:16 Universal Time on June 1st. At that time, an eclipse of magnitude 0.601 will be visible from the Arctic coast of western Siberia as the midnight sun skirts the northern horizon." Not all places in the eclipse zone are in line for a midnight event. 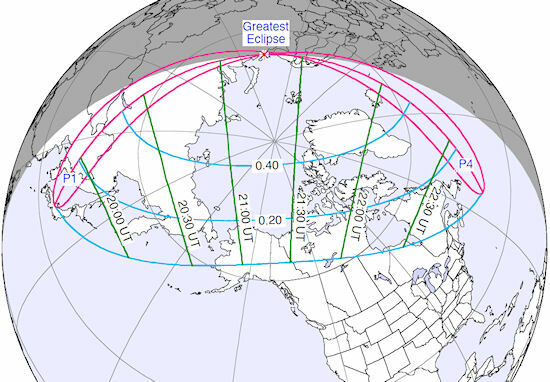 Espenak notes that Reykjavik, Iceland, will experience a 46% eclipse just before sunset--a nice way to end the day--while northern China gets its eclipse at sunrise. A table from NASA lists key times for major cities. The fact that this eclipse is partial rather than total will not diminish its beauty. On the contrary, it could be spectacular. At midnight in Norway, the bloated golden disk of the sun will be hanging low in the north. Imagine that disk transformed into a crescent, surrounded by the red and orange hues of a sunset sky. "This is going to be good," predicts Oedegaard. Sky watchers in the area should be alert for long, crescent-shaped shadows cast by the eclipsed sun, especially on surfaces (walls and cars) located behind leafy trees. No trees? Try this trick: Criss-cross your fingers waffle-style and let the sun shine through the matrix of holes. You can cast crescent suns on sidewalks, driveways, friends, cats, dogs and so on. The creative possibilities for hand shadows are sky-high (see the winking turkey, below). This will be the first midnight Sun eclipse in Norway since 2000 and the deepest one since 1985," says Oedegaard. "Scandinavians must wait until 2084 for an even deeper midnight eclipse." Norwegian readers will be interested to know that the eclipse can be viewed from the counties of Mre og Romsdal, Trndelag, Nordland, Troms, Finnmark as well as Spitsbergen. The event begins at 22:37 local time (20:37 UT) and ends at 00:22 (22:22 UT). For the rest of us, Oedegaard will attempt to broadcast the event live at this URL. "Weather permitting," he cautions. Return to Science@NASA post-eclipse for images of the event.